Daisy and Sheenyjek are Alaskan huskies from very long freighting lines and together with Seamus they form the foundation of my up and coming recreational dog mushing team. Like my other dogs, they were rescued from the Fairbanks North Star Borough Animal Control shelter. I brought them home on April 24th, 2006. These photos were taken the same day, and the green ears are a result of their having been tattooed for identification. 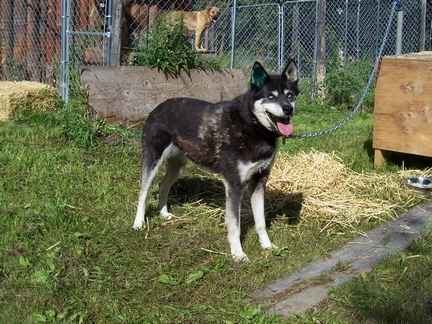 Daisy is a black-sable with the ice blue eyes that are very common in her Siberian husky ancestors. 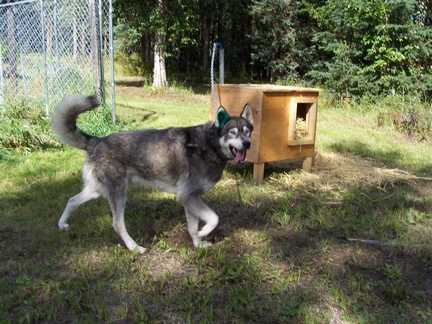 She was nine years old when I rescued her from the Fairbanks North Star Borough animal shelter. 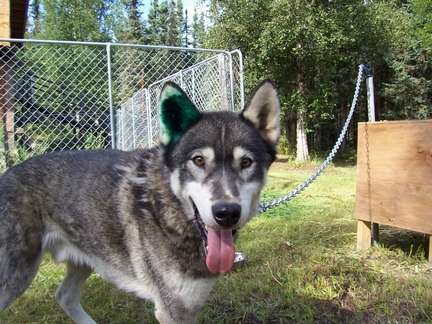 She was bred and whelped in the famous Denali Park Backcountry Patrol team and later was given to a local musher who needed classic freight dogs for transporting supplies into the park. 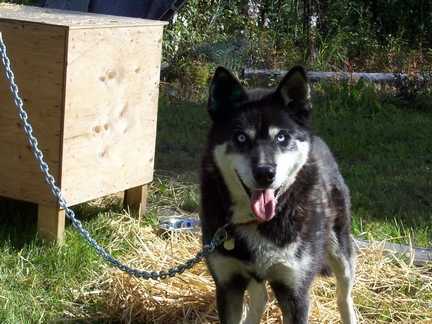 She is a well-trained lead dog who enjoys running single lead and skijoring. Sheenjek, named after the Sheenjek Wild and Scenic River, is one of Daisy's pups. He was born and spent his entire life in the same kennel until he and Daisy were relinquished to the shelter due to a catastrophic illness in the family. Sheenjek was 7 years old when I adopted him, and I was told that he runs at either the wheel or team position. At around 85 lb. he is very large even for a freight dog. He easily weighs twice that of a typical long-distance racing dog, can pull four times as much as the racer, but can only do so at about half the speed, While long distance racing teams frequently run at twenty miles per hour, most freighting teams lope along at a leisurely 10 mph.